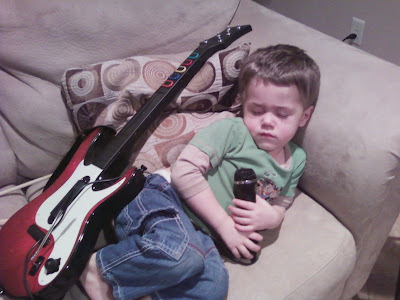 Being a rock star is hard work. Here is that standard side-shot of the pregnancy-in-process. I was very full after having just eaten Thanksgiving and its fixings, therefore it was a very good opportunity for the obligatory photo. Before you comment on whether or not you think I'm skinny for 16 weeks, please see the rules. We had a superb time with the Swensons of Las Vegas for the Thanksgiving weekend, and all 6 children ages 5 and under got along famously. The little 2 year olds were especially cute admiring Ben, who is only 2 months old; the 4 and 5 year olds mastered the art of imaginative play famously. The adults were fully occupied by keeping all the little ones fed and clean (and making sure all the bleeds had band-aids), followed by keeping the kitchen clean, and discovered that engineering ginger bread houses is best left to engineers. There is hardly the need to leave the house much when there are more little kids than adults. We are especially grateful for good friends; For the option to simply sit around and swap stories; to laugh at ourselves and analyze family dynamics, figuring out why everyone needs therapy and how we will mess up our own kids and ensure them a spot in therapy, too; For good friends who have to like you even though they know all the dirt there is to know about you. And now our kids have no choice but to like each other by nature of being 4th generation friends. Isn't that great? It's kind of like a quiz. To see what baby names you can come up with that fit my criteria. 1. Traditional but not too popular. And not made up. And it has to be spelled normally, like you could find it on a license plate keychain. 2. Our first two have biblical names that are two syllables. That works, but is not a requirement. Obviously we are not doing the same first initial for everyone; that's not my style. 3. It has to work with our last name and our other kids names. I've had perfect strangers advise me not to name any of our children Richard. I think I'm smart enough to know that. And I'm even going to make sure their initials don't spell something weird. 4. It has to be gender specific. That rules out Taylor and Jordan (and many others). 5. And I have to like it. So even though the name Jared fits the criteria, it makes me think of the Subway guy. Everyone has a right to name their kid whatever they want, so of course I don't intend to offend anyone. These are my personal preferences for my kids. Can you think of baby names that fit these criteria? Hopefully you will think of some that I haven't thought of yet. And vote on the sidebar on what you think it will be, a boy or a girl. We will probably find out the baby's gender some time after Christmas. Three simple rules. That's all. 1. Prego is an Italian word meaning "I pray" and is used in response to "thank you." It is also a popular and very tasty brand of pasta sause. Please don't use this word to describe me. 2. Please don't tell me "You're so small!" It seems about the same as saying "You're huge!" Likewise, "You do not look __(number between 12 and 40)__ weeks!" seems just as pointless. Why do people feel the need to comment on the size of your middle, small or big? I'm putting in my time and feel as pregnant as I am supposed to. On the other hand, if you feel that you absolutely must comment on how a pregnant woman looks, "You look terrific!" is always nice to hear, whether or not it is true. 3. Horror Stories. Yeah, I know my fair share of pregnancy, delivery, and misscarriage horror stories. There is a time and a place for swapping stories of this type, but please not in front of me while I'm pregnant. I feel like pukeing constantly and I have never felt more tired in my life. Soon I will be comiserating about sciatic nerve pain, eventually about kicks to the kidneys and my hips being sore from sleeping, and having to pee every 20 minutes. And the reflux. There are more things that I have blissfully forgotten that will soon come back to memory with fondness. I'm not complaining, I'm just telling you so that you don't have to ask me how I'm feeling unless you really want to know. If you are itching for a way to help me out, I'd be happy to lend you my first two children so that I can take a nap, provided that they are returned with Cafe Rio take out (hold the cilantro) and that Samuel comes back potty trained. There is also a mop in my closet that could use a pass on my kitchen floor, because I'm really not in the mood for mopping right now. My Halloween costume this year was the way I announced my pregnancy to our ward. Some people didn't get it. They'll figure it out eventually. Ever since (before) last Halloween, Leah has been periodically announcing what she wants to be for the next Halloween. Here is a not quite comprehensive list of the past year. ...and lots more I didn't write down. On October 1, I asked for a final answer so I could make her a costume. I asked her every day after that to make sure she still wanted to be that thing. And here we are: My little pink Unicorn! Coming soon... Samuel the (nice) bat, and Jenny's oven. October 17, 2010--Fosdick Industries, dormant since 2008, announce that developments for Product C are currently underway. At this early stage of product development, it is unknown whether the newest product will be packaged in pink or blue. Jenny Fosdick, CFO and Architect of Product C is hoping to diversify the portfolio with an unprecedented tow-top this time around, and possibly pink packaging. Products A and B have expressed opinions about the name for the newest development; among the contenders are “Tree” and “Charlie Brown.” The board, which meets in Provo, UT, is currently accepting additional nominations. Fosdick Industries introduced their first prototype in 2005(pink), followed closely by the second in 2008(blue). Product A has shown progress in literacy and counting. Product B has yet to master waste management procedures. Critics are hoping that with such a lapse in product deliveries, perhaps the newest model will sport more advanced features than previous models. At only 10 weeks into the project, the Architect has been displeased by data input rejection, however development associates assure that this is normal and good and will not hinder product development. Current development needs include lots of substance input in the form of carbohydrates and chocolate, as well as lots of rest. Research and development teams anticipate that 1 prototype will be completed in May of 2011. Chris is studying for a major certification exam, so we haven't seen much of him lately. Poor guy--he is so stressed. Come Saturday evening, he will only have to worry about finishing his last semester of grad school instead (haha). Leah is loving preschool and having fun with her little friends. She is so creative and imaginative, and always a problem solver. Samuel is almost a big boy (except he insists on wearing diapers). He is such a sweet little guy, knows all his letters, loves to be read to, and has been really cuddly (love it!). This is what happens when Samuel doesn't take an afternoon nap. He managed to fall asleep despite the current conversation about icing gingersnaps with chocolate so that we could eat them for dessert. This is us swimming in Washington after 14 hours in the car. Samuel goes under water with his mouth and eyes open and comes out smiling every time. That kid has no fear, which worries me. How do you teach a four-year old how to jump rope? I'm not sure. I just had her watch me jump rope and she practiced and figured it out in a day! Explanation: Samuel is wearing underpants during our 3-day attempt at potty training. We ventured out to Seattle, WA last week to bid bon voyage to Chris's mom Pearly who is moving to Turkey for a two year job assignment. I hadn't realized that we would be in a hotel with a pool, so of course didn't have my suit. (I needed a new one anyway, I just didn't expect to be swim-suit shopping tired and cranky and in 24 hours of grunge and body odor, with two tired and cranky children.) For the record, Samuel is a little swimming-pool daredevil and is not afraid to go under. And he always comes up smiling. He would jump right in to the deep end if I didn't stop him. Anyway, it was nice to sleep and swim in the pool, but the best part was spending time with Lola and getting in some quality Lola-grandkids time! She spoiled us with buffets and toys and gadgets that she is leaving behind in the states. We also celebrated Chris's 31st birthday. You will notice in these pictures that my kids are always tired; we really ran them to the ground in order to get the most out of every day! Additionally, we brought her van back to Utah with us for our family to use while she is away! That meant driving two cars home, which is 36 hours I don't care to remember (except there are 5 pounds stuck to my gut that won't let me forget). We had to stop at a mall and buy books on CD to keep us each awake in our separate cars. We are glad we were able to visit Lola one more time before she ships out. We will miss being near her, and I know she is making a lot of sacrifices to leave the states, her home, her friends and family, her job, but it is such the right place for her right now. We will miss you, but we are so happy for you, Mom! I've been working on a garden since March. I am kind of lazy though, and mostly garden in my pajamas when it is convenient (aka not 100 degrees outside), and rarely pull weeds. As a result, my strawberries are really sad, and my cabbage was eaten by slugs and has now rotten. On the up side, my corn will be plentiful soon, my carrots are growing, and my two surviving tomato plants look promising. And I have lots that I am already picking! I have pulled one onion, 1 beautiful head of lettuce (which I am going to serve for dinner tonight), perfect green onions, lots of plump zucchini, and hoards of jalapenos. What am I going to do with jalapenos? One thing is for sure: when my work lab needs 60 pounds of zucchini this fall, I will be providing most of it from my back yard!!! Coming soon: details of our latest adventures, trips, and birthdays! What happens when you put two ambitious women in the same house for 2 weeks, one with a stylistic vision and the other with a credit card, and nothing to do but watch and entertain a bunch of little kids? Redecorate the bathroom and hall! The project consisted of stripping the wallpaper, scrubbing the paste off, spackling, sanding the spackle, masking the woodwork, painting the walls (3 colors) and the ceiling, selecting and installing a mirror, light fixtures, switchplates, drawer pulls, and lastly cleanup. Mom trusted my vision of what would be a good look for the bathroom, took the leap of faith on some new, vibrant colors, and on painting the oak bathroom cabinet, and it turned out great!